Mom said no books, no games, no homework, no newspapers, no elbows on the table during supper. No radio, no TV, that was in the fronch room anyway, but still it had to be turned off, and no singing at the table during supper. That left lots of room for talking, asking questions, and laughing. No matter what was for supper, if I was the table-setter, I put down a plate with a fork on the left, knife on the right, and a teaspoon right next to the knife, plastic glass above the knife, glass glass for Dad, he didn’t like the feel of plastic. Of course, the baby only got a bowl and a spoon on the tray of the hi-chair pulled up, to the corner right there between Mom and Dad, no one would give a baby a knife and fork. At our house, Mom sat at the head of the table in the rolling chair, so she could get up fast to get stuff. When I was the table-setter, I got to sit in a rolling chair, too, ’cause then I got to be the hopper. Sometimes when Dad had to work overtime, his chair was empty. I always sat a place for him anyway, just in case he got home, so it was a tinsy bit like he was there, even if he wasn’t. Once I told Dad that blue cheese smelled like his feet. That made him hopping mad. Dad hardly ever got mad at us kids, but when he did, it was usually at me. He kinda liked me having a mind of my own, but not so much me saying all my thoughts out loud. I figured out later, with the help of Mom, that I hurt Dad’s feelings by saying his feet smelled like blue cheese. Dads sometimes got mad when their feelings got hurt, instead of just saying like moms do, “Hey, that was mean, now say you’re sorry,” then after that, everything gets back on track. With Dad, sometimes I needed help figuring things out. I always hated being off track with people, especially Dad. That’s probably how Jesus and all the Apostles felt at the last supper: all off track. 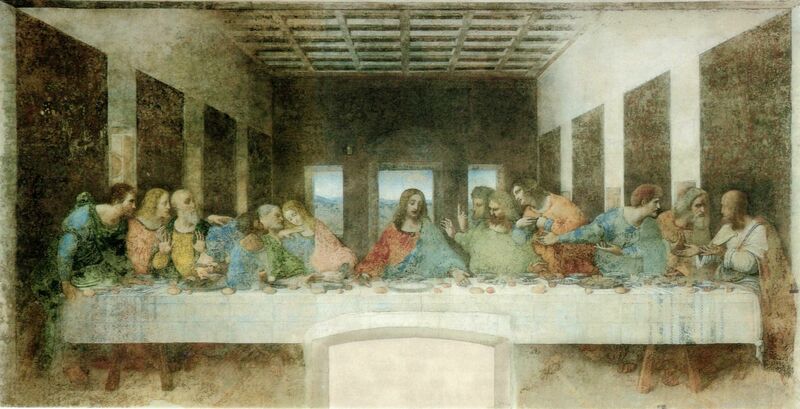 Here they were having a nice Passover supper, ’cause no Easter yet. First everybody started fighting about who would sit next to Jesus, just like Deanna and Bonita and Vickie fought over getting some of that white stuff from the meat bone. Then Jesus announces that one of his best friends was gonna turn against him, and all the apostles started saying “not me, not me,” and looking around, trying to see who had the guilty look on his face. That Judas was a bad guy for turning Jesus over, but I felt sorry for him anyways. I got to thinking maybe he just had a mind of his own, and thought he was doing a good thing, ’cause afterward he felt so sorry he hung himself. Sometimes my ideas turned out all wrong, like when I took a bite out of the rubber spatula just to see how it tasted, and then it seemed like nobody wanted to listen to the reasons why I did it. I was just in trouble. Maybe Judas should have talked thing over with Jesus’s mom before he got the whole ball rolling. Mary was probably good at figuring things out, ’cause most moms are. Or maybe he should have just spoke right up, instead of sneaking around and making all those plans by himself. Then somebody would for sure have said, “Wait just a minute now, that’s not nice,” and everything could get back on track. With all my ability to reason with a grown up mind, this story continues to puzzle me. Why must the story of our salvation be such a sad and confusing story of mistrust, betrayal and brutal suffering? Once long after I was no longer a little girl, a nun asked this provocative question: Could Jesus’ death have the power to redeem, if he had not been executed and instead, died of old age? I asked G-Money that question and after pondering it a bit, he said, “Well, maybe it’s good we only sinned as much as we did, because sometimes living a long time and dying of old age means enduring boat loads of suffering.” I asked Mom that question and she said, “For the love of Mike, sometimes I just can’t believe the things you think about.” Right after ‘thinking for myself’, ‘thinking too much’ is the next most often compliment-complaint I hear. Thanks for reading, Sharon and Julie. You inspire me to write more.